Welcome to Iceland’s otherworldly countryside, where steam rises from the hillsides and the Northern Lights dance overhead. Only steps away from the vibrant village of Hveragerði, Frost & Fire enjoys access to village life—pubs and cafés, a geothermal park and small village park, ice cream parlor and sweet shop and much more. 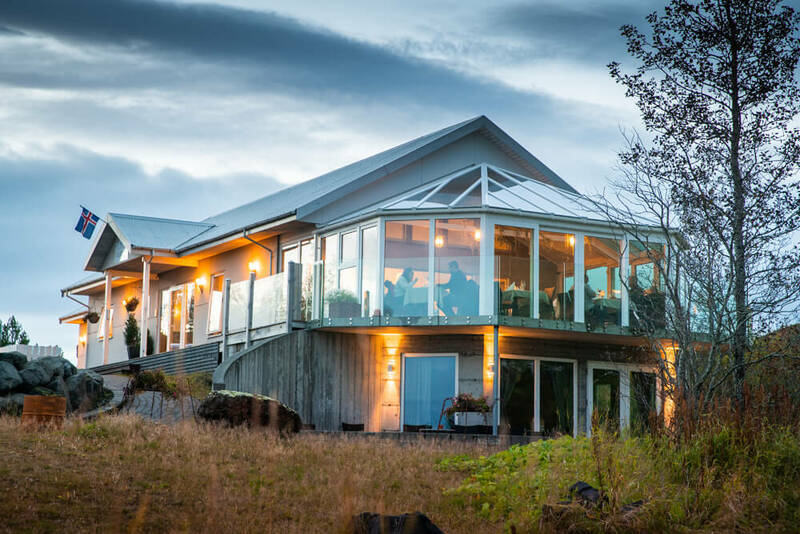 As the gateway to Iceland’s thrilling South Coast, Hveragerði also serves as the ideal home for short trips to see Iceland’s most iconic natural and historical attractions. Explore powerful waterfalls, black sand beaches, lava caves, glacier lagoons, geysers, Viking-age farms and the legendary Þingvellir parliamentary plains—Frost & Fire puts you in the perfect location to discover these must-see sites. 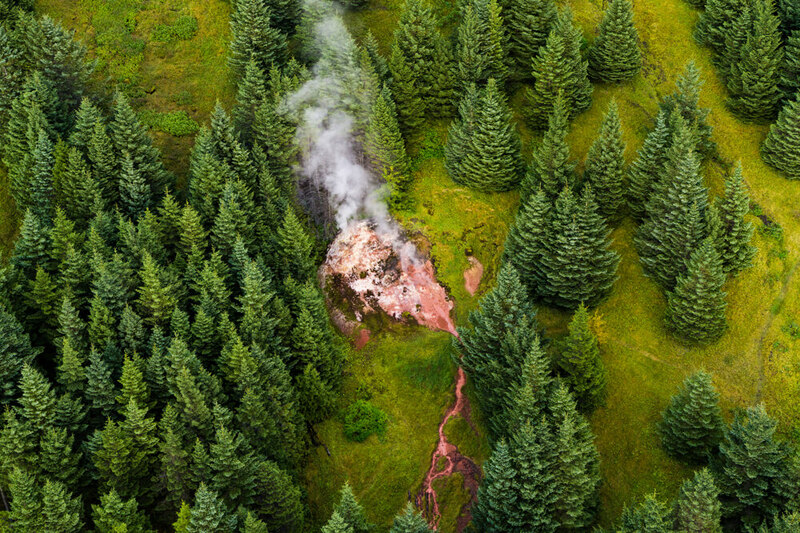 The tectonics of the earth around Frost & Fire give the entire area a range of unique activities—from hot-spring cooking and geothermal horticulture to thermal bathing and earthquake tourism. 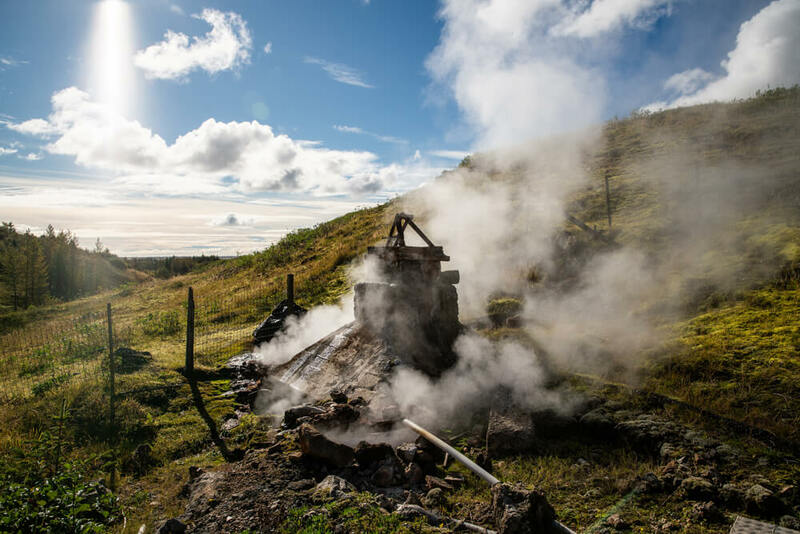 This makes even typical recreational activities—like hiking and golfing—a remarkably Icelandic experience when you add hot springs and steam rising from the ground. In Iceland, every community has its swimming hall and Hveragerði is no exception. Although they are typically quite simple affairs with basic changing rooms and showers, most swimming halls include a pool and hot tubs, which (depending on the size of the community) oftentimes become the de facto social clubs in town. Local swimming halls are, indeed, a quintessential Icelandic experience. Fortunately here in Hveragerði we have fantastic swimming hall known as Laugaskarð, which has been a point of pride for the village since it opened in 1938. For a long time it was the largest swimming pool in Iceland and is still fed by the ample geothermal water generated in the hills around Hveragerði. In 2008 southwest Iceland experienced an earthquakes registering a magnitude of 6.1 with its epicenter not far from Frost & Fire and the village of Hveragerði. Luckily no one was killed during the quake, but the locals were (pun intended) quite shaken up! There is a small exhibition on the earthquake in Hveragerði where visitors can see footage from the quake and even step into an earthquake simulator to experience what an earthquake of similar magnitude might feel like. The exhibition is free although there is a small fee to use the simulator. Venice has its canals. Las Vegas has its casinos. And Hveragerði has its hot springs. 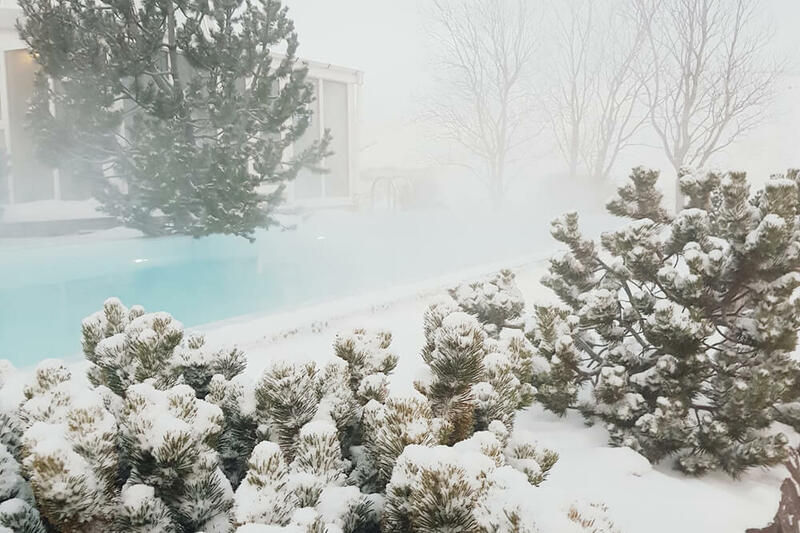 Hot springs have become synonymous with Hveragerði. Literally. The village’s name means “hot spring garden”. The springs are not just a quirky remnant from a bygone era, but very much a living part of the daily life in Hveragerði. The hot springs have given rise to some of the most sophisticated geothermal horticultural systems in the country (and beyond), a local culture that relishes bathing and soaking in geothermal waters and even a rich tradition of hot spring cooking, including the region’s time-honored “hverabrauð”, a dense, slightly sweet rye cake cooked in the springs. In fact, the Varmá restaurant in Frost & Fire is proud to be one of the few kitchens that preserves this heritage method of cooking, creating innovative dishes characterized by hot spring cooking and featuring local ingredients. Just beyond the hotel further inland is the Hveragerði Golf Course at Gufudalur, whose name literally means “steam valley”. The 9-hole course is popular for its beautifully bizarre landscape flanking the Varmá thermal river and for some unusual hazards like open hot springs and plumes of steam. For more information contact Hveragerði Golf Club at +354 483 5090. The area around Frost & Fire has long been a center for geothermal gardening and horticulture. With its warmed earth and plentiful hot water and renewable energy, the ground is an ideal place to cultivate produce, flowers and other vegetation in an otherwise somewhat inhospitable environment. Not only is Hveragerði home to the horticulture department of the National Agriculture University, but the home gardens of Hveragerði are also said to be the envy of the nation. Þingvellir national park – The only UNESCO World Heritage site on the mainland and is remarkable not only for its history as the birthplace of Iceland’s ancient Alþingi parliament but also for its tectonics, including the Almannagjá rift valley. Geysir geothermal area – Geysir is the original erupting hot spring and the namesake of all “geysers”. Although it only rarely erupts, the adjacent Strokkur hot spring erupts dependably every few minutes. 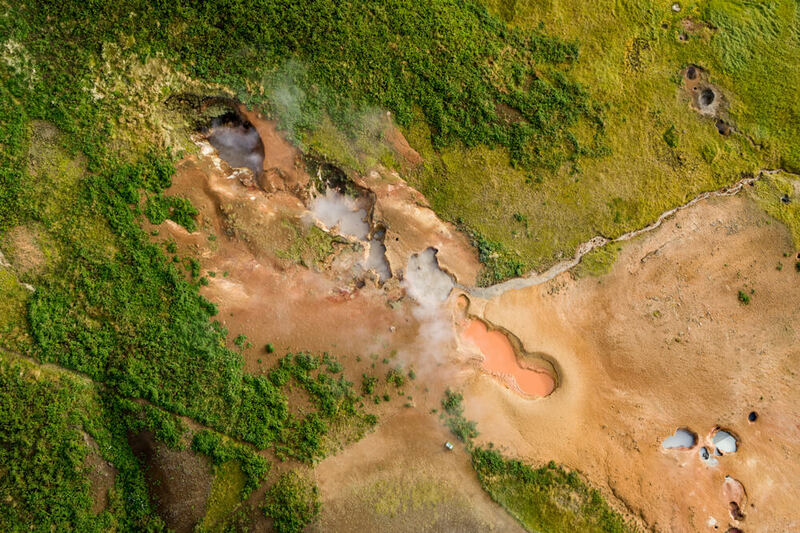 The entire area is rife with geothermal activity like fumaroles, bubbling mud pots and thermal pools. Gullfoss waterfall – Gullfoss is an incredibly powerful waterfall that visitors can view from a variety of vantage points. During the summer, you can walk right up to the cascade, getting close enough to feel the spray of mist on your face. 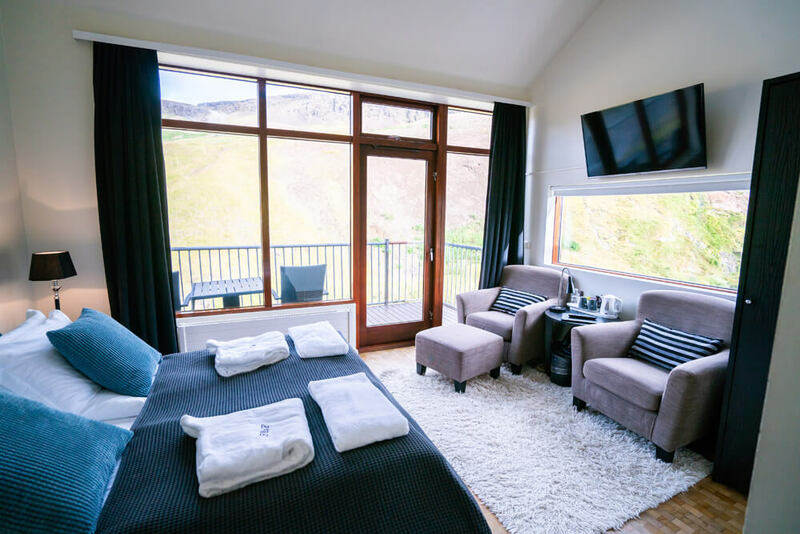 The area immediately around Frost & Fire is ideal for casual walks along the thermal river, to a small waterfall and the cliffs overlooking Hveragerði village. 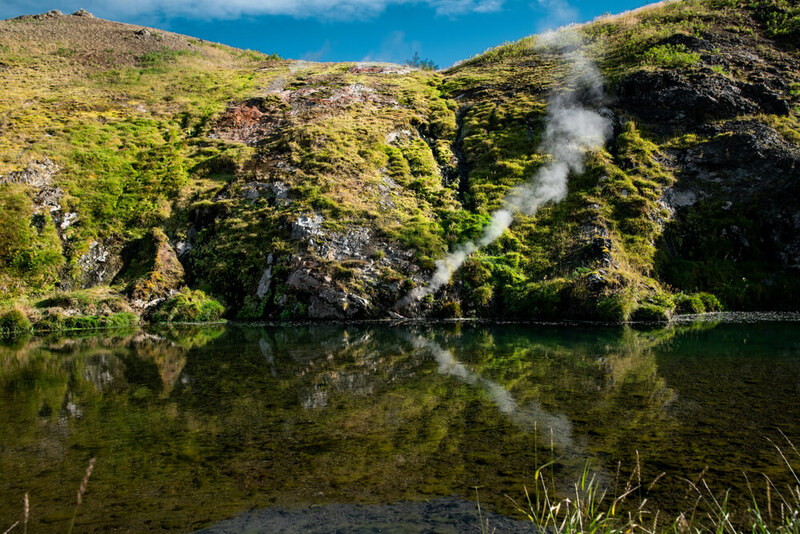 There are also longer signposted hikes into the geothermally active area around Mount Hengill volcano, including hikes to mountain lakes, small historical sites and geothermal formations. 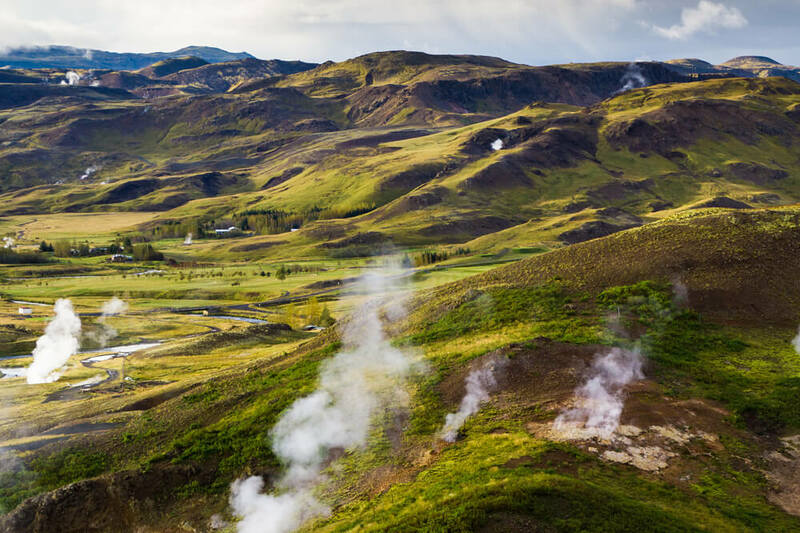 The valleys just north of the hotel — Reykjadalur and Gufudalur — are popular among hikers and sightseers, especially when they stop for a dip in the thermal pools where the hot springs run into the Reykjadalsá river. 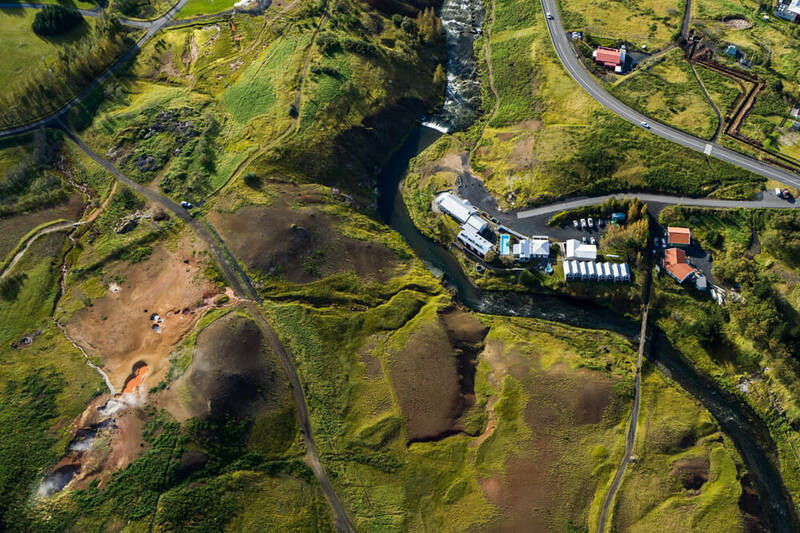 Reykjavík Energy maintains the hiking paths in the area and publishes a map of the trails and sites in English.